SNCB (the National Railway Company of Belgium) has got it covered, and by “it” we mean several dozen disused and retired locomotives and coach cars. Formerly a repair and maintenance depot, the location became a pure storage facility in the year 2000 and unlike Sydney’s sadly decorated trams, the trains here are protected and preserved. Kudos to Haikyo.org for capturing some spectacular images of the quietly beautiful post-industrial place and also, for not revealing its location. Opened in 1904, the Rozelle Tram Depot was home base for as many as 200 public electric trams (San Francisco-style trolley cars) that serviced metropolitan Sydney for the better part of the twentieth century. The depot closed in 1958 and was used for workshops, maintenance and storage for several decades. In recent years the Rozelle Tram Depot was home to six historic trams, all of which were in excellent condition until the year 2000. 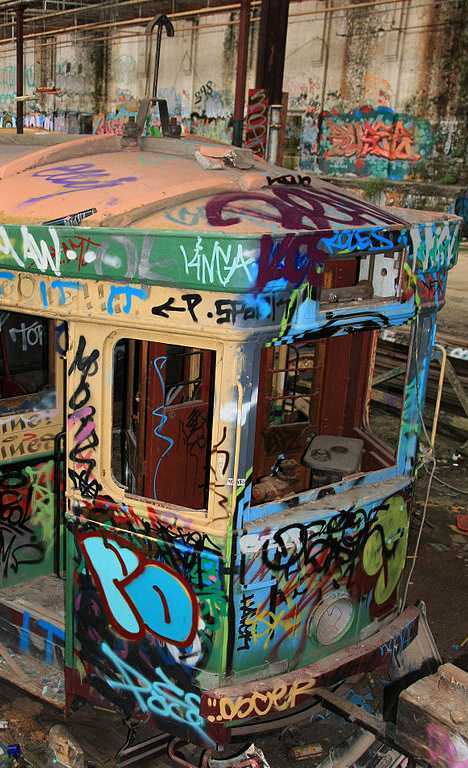 Unfortunately and rather shamefully, however, vandals were able to access the depot with ease and the trams were extensively vandalized and graffiti’d inside and out. It would be nice to think the befouled trams will be saved and restored when the depot is finally razed by new owners intending to erect medium-density housing at the site. That possibility is looking very bleak, however, as only a single fenced-off tram remained at the depot in February of 2014. Ronald Reagan once predicted communism was destined to end up on the ash heap of history; these communist-era trains and rolling stock are about to crumble into historical heaps of rust. Known as Istvántelki Fomuhely, this Budapest train graveyard is fortunately free (well, mainly) from the ravages of vandalism and graffiti though natural decay is proceeding at a gradual but inexorable rate. 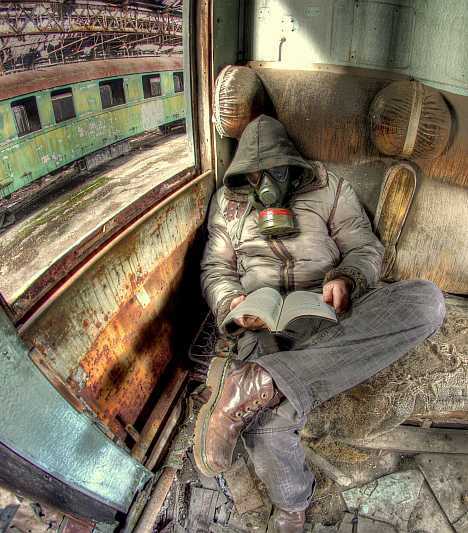 Flickr user Tibor Smid has applied image processing techniques to best advantage in his 44-photo set documenting Istvántelki Fomuhely, and interposing gas mask wearing people into some of the scenes adds a creepy post-apocalyptic vibe. All aboard the ghost train… destination unknown.